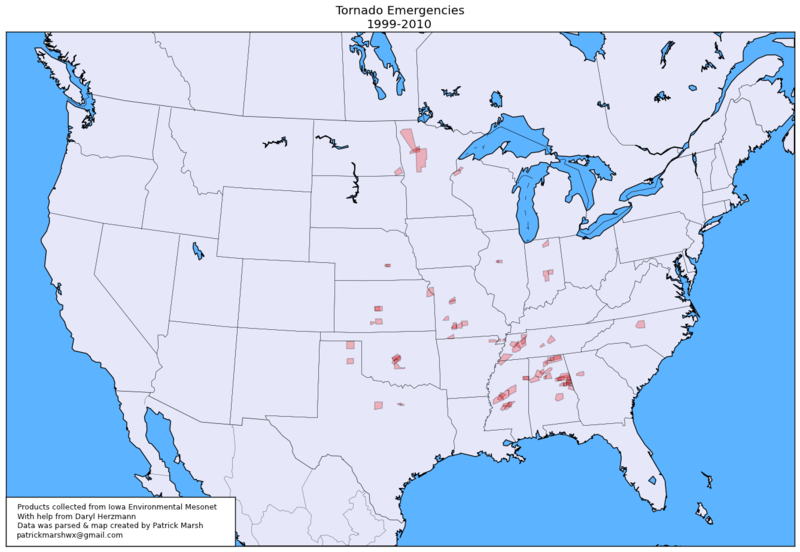 Below is a map of all tornado emergencies issued since 1999. Keeping with my definition of a tornado emergency, the polygons plotted are the polygon described by the “LAT…LON” tag at the bottom of either a) the first severe weather statement (SVS) that contained the “Tornado Emergency” phrase, or, if no “LAT…LON” tag was present in the SVS, b) the parent tornado warning (TOR). If the “LAT…LON” tag was not present in either the SVS or the TOR, I used the county listed in the original TOR. This only happens 3 times: Ochiltree County, TX (2000); Johnson and Marion County, IN (2002); and Hancock County, IN (2002). I’ve done more analysis, but will save that for later. And, since I know I’ll be asked, here is the same map but without 2011.